UNCG’s Institute for Community and Economic Engagement (ICEE) was created in the spring of 2008 in response to the charge from then President of the University of North Carolina System, Erskine Bowles, and the UNC Board of Governors that all campuses would position themselves to respond to the most pressing needs facing the state. ICEE functioned as a virtual organization which bundled all of UNCG’s community and economic engagement activities under one umbrella. 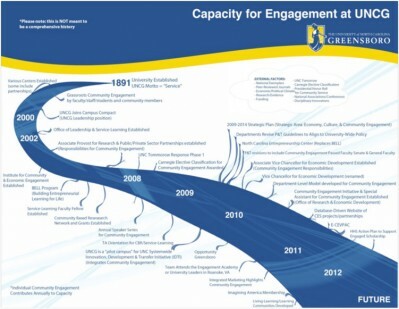 In September 2010, the Community Engagement Initiative (CEI) in the Office of Research and Engagement (ORE) (formerly Office of Research and Economic Development) at UNCG was created to support excellence in community engagement across UNCG and with the greater community. The CEI was established to “support community-engaged scholarship,” a key goal (4.3) of the 2009-2014 Strategic Plan. The Special Assistant for Community Engagement was tasked with implementing a comprehensive and inclusive visioning and planning process to support excellence in community engagement, including exploring and proposing revisions to ICEE, UNCG’s university-wide structure to provide the resources, programs, processes, recognitions, and support needed for community-engaged work. ICEE was re-launched in July of 2012 as both a virtual and physical presence and advocate of community engagement in response to the implementation plan for Strategic Goal 4.3 that called for establishing an “office” to support community engagement university-wide. ICEE provides one highly visible point of contact for the external community for campus activities related to community and economic development, while providing structure to and support for UNCG faculty, staff, and students interested in community-engaged research, teaching, and scholarship. ICEE brings together community engagement and economic development within one institute in the recognition that pressing social and environmental issues are complex, multi-faceted, and interconnected, and therefore, must be addressed through a full range of approaches and by a full array of stakeholders. The river diagram illustrates many (though not all) of the initiatives, activities, and structures that have built UNCG’s capacity for community engagement. Capacity, as it is used here, is the ability and will to look beyond our walls within the academy to embrace and partner with individuals, groups, and organizations from across all sectors to address the critical issues of our times, from local to global. The purpose of this image is not to provide an exhaustive history of factors that led to community-engaged policies. Rather, the purpose is to show the factors that led to UNCG’s capacity to take a dramatic step forward to further institutionalize support for community engagement through passing promotion and tenure guidelines to support community-engaged scholarship, as well as the momentum that is behind our current efforts to become even more excellent in this work. A river ecosystem starts as a trickle, originating as headwaters. The university culture begins with its historical mission and structures. At UNCG, we were founded as the State Normal and Industrial School and then became The Woman’s College of the University of North Carolina. Since our founding, our motto has remained as one word: “service.” As a public university, UNCG was chartered to serve public interests. The capacity of the river grows as tributaries add water to the stream. As more water flows into the river, the water becomes deeper and the current becomes swifter. Momentum generated by the force of water can become a powerful force. Capacity for community engagement comes from all the activities and efforts of faculty, students, community colleagues, groups, and organizations, university administrators, staff, and alumni. At UNCG, these tributaries include offices such as the Office of Leadership and Service-Learning, and Centers such as the Center for New North Carolinians and the Center for Youth, Family and Community Partnerships, and now the Community Engagement Initiative in the Office of Research and Engagement. It includes student-led service trips, and faculty-led service-learning. It includes community-based research grants, as well as initiatives to support economic development. This diagram is not exhaustive. It only provides some indication of the vast and myriad factors – both formal and informal, both individual efforts and collective initiatives – that have brought us to where we are today. The capacity of a river is also enhanced by rain that falls from clouds. The swelling number of local, regional, state, national and international associations, conferences, journals, scholars, reports, recognitions, and resources for community engagement has undoubtedly contributed to UNCG’s capacity. These rain clouds are not unique to UNCG, they are shared by most, if not all other institutions of higher education. Many of these resources can be found across this website, particularly on the Definitions and Scholarly Resources pages. Tapping into local and international discourse and resources allows us to accelerate our efforts toward excellence. To learn more about these initiatives, or UNCG’s strong momentum generated towards community engagement, contact Emily Janke, Ph.D., Director of ICEE, at emjanke@uncg.edu. UNCG remains committed to building capacity for community engagement – and part of our ability to do so is to know about and share stories about how we are interconnected to the work and lives of others. This is why we have developed the Community Engagement Collaboratory – a database designed to educate, inspire, and activate potential partners. Whether you are providing direct services at a nonprofit organization, teaching professionals and residents of a community, conducting research with non-academics, or are engaged in some other UNCG-community project, our Community Engagement Collaboratory allows all members of UNCG-community partnerships to document and display their engagement in a centralized and Web-accessible place.